Remodeling any area of your home can be a stressful undertaking. There are lots of details to think about, not to mention a budget to adhere to, and making sure you get everything just right is important for your physical and mental health. Starting with a good plan and staying organized is essential, so sit down and make lists of all the tasks you want to accomplish before you make any decisions. DIY jobs require lots of patience and planning, so these lists will help you stay on track. As you write down all your goals, do some research and figure out how much you can expect to spend. Having a good idea of what your budget will be -- and how to stick to it -- will help reduce stress throughout the process. It’s also important to make sure you ask for help when you need it. Many DIY projects can be completed by one or two people over the course of a weekend, but some tasks--such as electrical wiring or installing plumbing--should always be done by a professional. Keep reading for some great tips on how to handle a DIY bedroom remodel safely. Most remodels involve painting, redoing furniture, and installing storage solutions like shelving, so it’s a good idea to remove as much as possible from your bedroom before you get started. This will not only give you more room to move around, it will also protect your belongings from paint splatters and damage. It’s best to use a self-storage unit and Lockaway Storage in San Antonio and Texarkana can help. You can move your items into temporarily while you’re working, especially if your job timeline is two days or more. If part of your remodel includes getting a new mattress, it’s important to have a plan for the old one. Many recycling centers can’t take mattresses because they don’t have the resources to pull them apart and break them down, but there are organizations in many cities that will take a mattress off your hands. If you can’t find one, you might break it down yourself -- carefully -- by stripping the coils and wood pieces from the inside and recycling them separately or using them for a fun DIY home decor project. 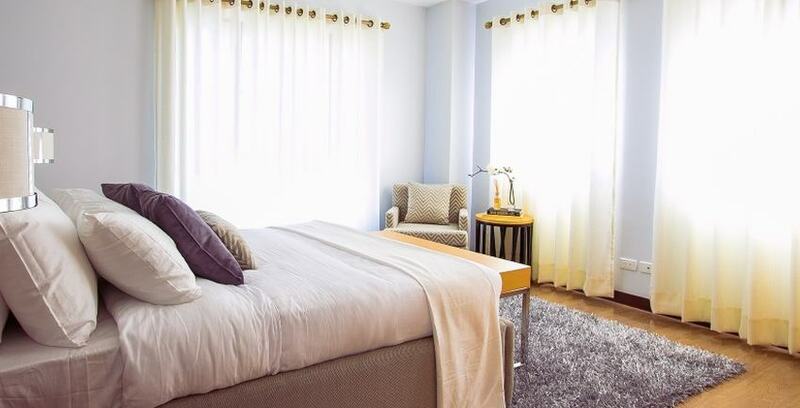 The right paint and curtain colors can help your mood and your ability to get good rest, so choose carefully. It’s usually a good idea to stay away from bright shades, like red and pure white, as these tend to be stimulating and can interfere with your sleep. Instead, go for calming, neutral shades of high-quality paint, such as blue or green, and look for sun-blocking curtains or blinds that will help you get some good shut-eye until you’re ready to get up. Cleaning up after yourself can add some time to your project, but it’s helpful in the long run. Not only will it allow you to keep from tracking dust or splattering paint onto the floor, it will keep things relatively neat and organized throughout the process. This can help you reduce stress; after all, it can be hard to work in a space that is cluttered and messy. Have plenty of paper towels, trash bags, and cleansers on hand to keep things neat. Taking on a DIY project can be overwhelming at first, which is why it’s so important to start with a good plan and do some research before you make any decisions. Make plenty of lists, ask for help when you need it, and keep your physical health in mind when moving furniture around. With the right preparations, you can complete your DIY project without the stress. Lockaway Storage has many solutions for your project like packing supplies and storage units for any sized project. Find a local facility today and see how a storage specialist can help you.